New York attorney general Eric Schneiderman could severely depress Exxon Mobil stock values while piously claiming to protect shareholders from fraud. Welcome to the Orwellian world of climate-policy sanctimony. The purpose of the Martin Act is to arm the New York attorney general to combat financial fraud. It empowers him to subpoena any document he wants from anyone doing business in the state; to keep an investigation totally secret or to make it totally public; and to choose between filing civil or criminal charges whenever he wants. People called in for questioning during Martin Act investigations do not have a right to counsel or a right against self-incrimination. Combined, the act’s powers exceed those given any regulator in any other state. According to Deschert LLP, the Martin Act sets a low bar for establishing guilt. To convict a company of fraud, the AG does not have to show evidence of scienter — an intent to mislead. All he has to show is that the company misrepresented a “material fact” about its securities, and the Act defines “misrepresentation” broadly to include omissions of material facts as well as affirmations of false facts. By that logic, if Exxon Mobil’s public statements on climate-change or oil-market projections omit worst-case scenarios the company does not regard as credible, then it is guilty of defrauding shareholders. Apparently, Schneiderman wants to build a case that Exxon Mobil misrepresented the seriousness of climate change risks, hiding from investors the financial risks the company will face when science triumphs over denial and governments act to curb the production and use of fossil fuels. It’s a preposterous green fairy tale. Schneiderman’s investigation is conveniently timed to build on the green campaign demanding a Justice Department investigation of Exxon Mobil under the Racketeer Influenced and Corrupt Organizations (RICO) Act. Campaigners cite recent reports by the L.A. Times and Inside Climate News (ICN) allegedly revealing that Exxon Mobil knew the awful truth about climate change since the 1970s yet hid the risks from policymakers and the public in the 1990s and 2000s. Sen. Sheldon Whitehouse (D-R.I.) called for a RICO investigation in May — months before the L.A. Times and ICN published their reports. Both Democratic presidential front runners, Hillary Clinton and Bernie Sanders (D-Vt.), said they will call for a federal probe if elected. In fact, all the documents reveal is that (1) Exxon Mobil closely monitored and contributed to climate science in the ’70s and ’80s, (2) the “consensus” then, as now, was based on climate models with rather large acknowledged uncertainties, and (3) some Exxon scientists worried about worst-case scenarios. For example, ICN cites an August 1981 memo from Exxon manager Roger Cohen arguing it is “distinctly possible” that the warming trend after 2030 “will indeed be catastrophic.” ICN also cites other ’80s documents opining that climate sensitivity (the long-term warming after a doubling of atmospheric CO2 concentration) is 3.0 ± 1.5°C, and that unchecked consumption of fossil fuels would increase global average temperatures by 2ºC-5ºC during 2000-2100. Either ICN does not understand the climate science debate or deliberately obfuscates. The core issue in climate science is not whether anthropogenic global warming is real but how much warming there will be and with what impacts. 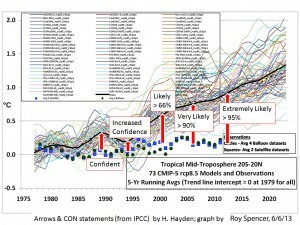 The IPCC’s increasing confidence that half or more of observed warming since 1950 is anthropogenic tells us nothing about the accuracy of climate models in forecasting future warming and the consequences. 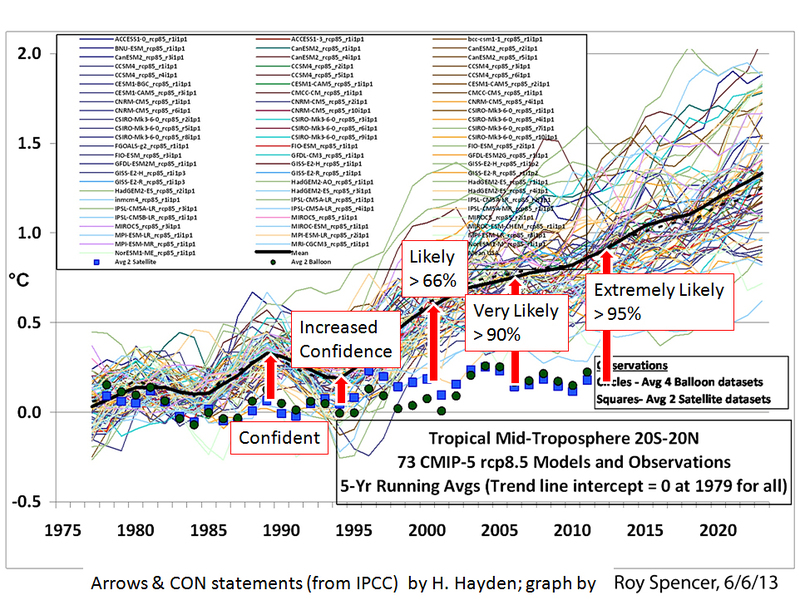 The IPCC’s confidence increases as its models increasingly fail to match reality. Figure explanation. Red: Hansen’s business-as-usual (no climate policy) scenario. 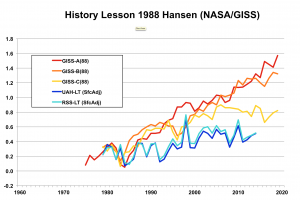 Orange: Hansen’s emission freeze at 1980s level scenario. Yellow: Hansen’s drastic emission-reduction scenario. Light blue: Remote Sensing System (RSS) satellite temperature record. Dark blue: University of Alabama in Huntsville (UAH) satellite temperature record. 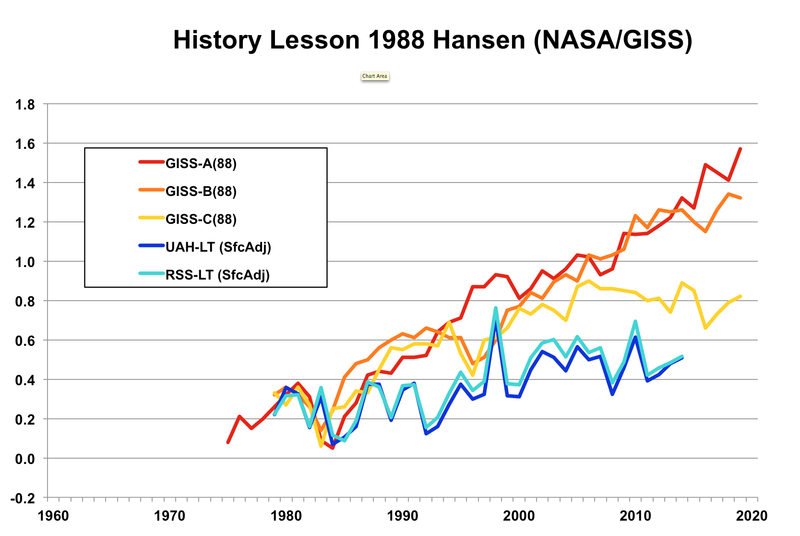 Although emissions increased as much as in Hansen’s BAU scenario, observed temperatures are lower than in Hansen’s drastic emission-reduction scenario. Besides, the notion that Exxon Mobil hid potential climate risks from policymakers and the public is goofy. The possibility that climate change might turn out to be a very big deal was impossible to hide given 30-plus years of UN-sponsored climate conferences, 30-plus years of IPCC reports, untold billions in taxpayer funded climate change research and advocacy, non-stop handwringing by scores of environmental organizations, and the associated media obsession with all things climatological. If anybody has been misleading the public, it is the taxpayer-funded climate research fraternity, which has long been in complete denial of the possibility that putting an energy-starved planet on a low-carbon diet could be a humanitarian disaster. Climate activist Bill McKibben blames Exxon Mobil for delaying so-called climate action by a “quarter century.” Again, either he thinks like a child or deliberately misleads his readers. 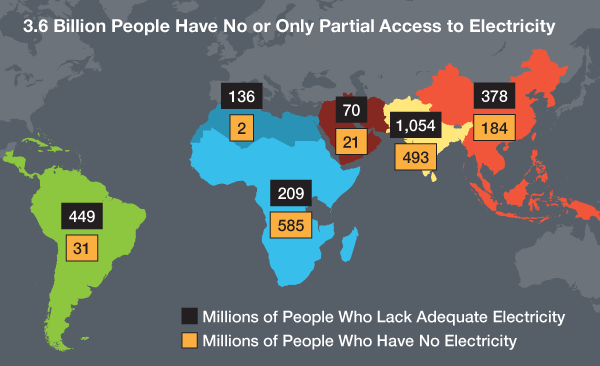 The long — and continuing — “delay” in climate action is due to the critical importance of affordable, reliable, scalable energy to economic growth, the widespread energy poverty that stifles development and kills millions of people each year in poor countries, and severe deficiencies in the cost and performance of renewable energy technologies and other potential substitutes for fossil fuels. (2) A responsible company does not “shift its business model” unless it believes alternative product lines are the wave of the future. No rational assessment in the 1990s or later would have led Exxon to be bullish on renewables. Despite Soviet-style production quota in 29 states and the District of Columbia, and decades of federal tax incentives, wind accounts for 1.8% of America’s total energy consumption and solar 0.4%. In contrast, reports Institute for Energy Research, petroleum accounts for 35.4%. (3) During 2000-2005, “BP invested $500 million into solar power and $30 million on wind and has invested more than $4 billion in alternative energy in the US since 2005,” according to energy analyst Marita Noon. That path proved to be unprofitable, as Raymond predicted. BP bailed out on its 40-year solar business in December 2011, dumped its investment in U.S. wind assets in April 2013, and exited from the cellulosic biofuel market in January 2015. Exxon Mobil wisely decided to stick to its core competence: oil & gas. (4) Carbon capture and storage (CCS) actually increases emissions. Even with subsidies, utility-scale CCS is not commercially-viable unless coal power plants can sell the captured CO2 for use in enhanced oil recovery (EOR) operations. When the recovered oil is combusted, it emits CO2. So much so that the net effect is to emit about 1.4-1.6 tons of CO2 for every ton injected underground. In commercial practice, CCS increases CO2 emissions by 40%-60% compared to a conventional coal power plant. (5) Despite decades of federal support, nearly all biofuel in the U.S. auto market is ethanol. Whether made from corn kernels, sugarcane, or switch grass, ethanol yields one-third less energy than an equal volume of gasoline. Lower energy content means inferior fuel economy, making high-ethanol blends a bad bargain for consumers. At current prices, driving on E85 (motor fuel blended with 85% ethanol) rather than regular gasoline would cost the typical motorist an extra $550-$1,150 a year (FuelEconomy.Gov, accessed 11/11/15). It would have been crazy for Exxon Mobil to “shift its business plan” from petroleum products to biofuel. Can Schneiderman Pull It Off? Until this week, I would have said it’s impossible for a grownup to argue with a straight face that Exxon Mobil’s shareholders don’t know how climate change risk creates financial risk for investors. Investors tend to be a better-informed subset of the much larger public that follows the news, and anyone who hasn’t been asleep for the past 20 years knows that an aggressive political movement, invoking an alleged scientific consensus based on (increasingly errant) climate models, wants to bankrupt fossil-energy companies via carbon taxes, cap-and-trade, renewable-energy quota, divestment, project denials, export restrictions, drilling bans, and other “keep it in the ground” policies. In the 2000s, I attended two annual Exxon Mobil shareholder meetings in Houston where climate campaigners introduced resolutions instructing the company to publicize shareholder risks from the company’s almost exclusive investment in fossil energy despite the alleged inevitability of a carbon-constrained future. Such resolutions, always defeated, were debated for years. The idea that Exxon Mobil has kept shareholders in the dark about the financial risks arising from “consensus” climatology is ludicrous. Regrettably, that does not mean Schneiderman poses no risk to the company’s shareholders. Earlier this week (Nov. 8), the AG reached a settlement agreement with Peabody Energy following a three-year Martin Act investigation. The settlement is based on the same climate risk = shareholder risk equation as the Exxon Mobil investigation. It is notable that Schneiderman did not hit up Peabody for damages, fines, or prison sentences. Apparently he could not find anything that a reasonable person would regard as fraud. No surprise there. Or maybe the investigation was a test run to assess the Martin Act’s utility for prosecuting bigger fish in the climate policy wars. One can only guess how this plays out. Exxon Mobil has deeper pockets than Peabody, so maybe it will be more willing to fight than settle. To repeat, “when the prosecution is over, trial lawyers can gain access to the hoards of documents that the act has churned up and use them as the basis for civil suits.” Just what Exxon Mobil shareholders don’t need! And the man has the chutzpah to pose as their protector! A media feeding frenzy over the documents would likely juice up demands for a federal RICO investigation, especially if Hillary or Bernie is president. Part 2 of this series, to be posted Friday, will examine the Peabody settlement and offer some unsolicited advice on how the company should comply. 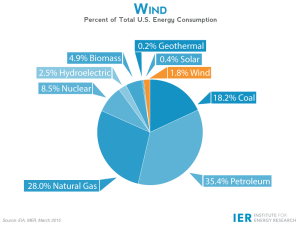 Previous post: Is War on Coal the Cause of Confounding Increase in U.S. Electricity Bills?